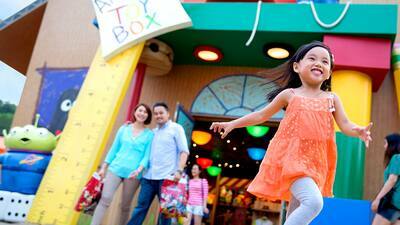 Stay at Kingdom Club Rooms, Hong Kong Disneyland Hotel for Disney vacation a fit for royalty! Enjoy up to 20% off Flexible Rate when you book in advance, and stay longer for less! *Hotel bookings must be made at least 1 day to 45 days in advance for respective room discounts. ^A 10% service charge based on the sum of discounted room rate and extra charge (if any) will be applied. When you stay at the Kingdom Club, you can be sure to receive the royal treatment - from personalized services, complimentary snacks and beverages, to bedtime stories with our cast members and meeting Disney Friends in pajamas at night. Catch a glimpse of our royal hospitality available at Kingdom Club through an immersive Virtual Tour. Satisfy your cravings with our complimentary dining selections, from early in the morning to late into the evening, with lots of mouth-watering choices. If you’re lucky, a Disney princess may even stop by to greet you. Assorted fresh pastries, cereal, fruit, hot breakfast selections and beverages. An assortment of homemade cookies, seasonal fresh whole fruits and beverages. A selection of scrumptious appetizers with your choice of complimentary beer and wine. Kingdom Club Lounge Delicacies are only available to Guests staying at Kingdom Club Rooms and Kingdom Suites at Hong Kong Disneyland Hotel. Kids are invited to express their creative side by participating in Kingdom Club craft-making activities. Ask a Kingdom Club Host or Hostess for today’s session times and what kinds of crafts are available. Personalized service and special activities add an extra level of enjoyment to your stay. Stay at any of the three Disney hotels during the Carnivale of Stars (March 7 to June 25, 2019) to receive complimentary spring-themed gifts, including an amenities box and slippers – sure to add a sprinkle of springtime magic to your stay! 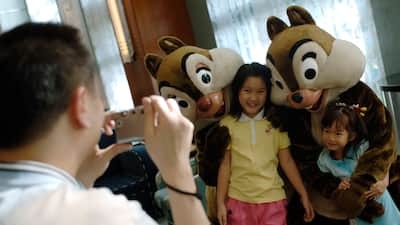 Guests can now enjoy Priority Admission Passes at a variety of Hong Kong Disneyland Park attractions, including family-friendly attractions and thrill rides! Priority Admission Pass(es) can be redeemed at check-in, and may be used at designated Park attractions and shows of your choice. *Subject to availability. Attractions and shows may be suspended or cancelled without prior notice. Priority Admission Pass will be given according to the number of guests in each room with a maximum of four guests per room. Actual offer price depends on the check-in and check-out date, the hotel and room category selected, the prevailing room rate, the number of staying Guests in the group and the respective ages of the staying Guests (subject to availability and any Benefits Limits as such term is defined in the Hotel General Terms and Conditions). The prevailing room rate for each Hotel is determined at the time of booking. A deposit equivalent to the first night’s room rate, extra charge (if any) and 10% service charge will be charged for each reservation at the time of booking. Disney Explorers Lodge: December 22 to 25, 2018, December 29 to 31, 2018 and February 6 to 9, 2019. Guest may cancel or amend the reservation at least 3 days prior to the check-in-date, except for July 21 to August 18, December 15 to 31, 2018, February 5 to 9, 2019, July 25 to August 20, 2019; in which case cancellation or amendment has to be made at least 7 days in advance. The full price of the deposit will be forfeited in case of any cancellation made after the prescribed period stated above or no show. Amendment of reservation is subject to availability and Benefit Limits, and no change is permitted after prescribed period stated above. This offer is valid for check-in dates from April 1, 2018 to September 30, 2019 with check-out date on or before October 1, 2019, except for December 22 to 25, 2018, December 29 to 31, 2018 and February 6 to 9, 2019 which are block-out dates. Guests are not allowed to cancel or modify a reservation once it is made. Any cancellation or modification will be subject to a charge equivalent to the first night’s room rate, extra charge (if any) and 10% service charge. Such charge will be deducted from the deposit. This offer is valid for check-in dates from April 1, 2018 to September 29, 2019 with check-out date on or before October 1, 2019, except for December 22 to 25, 2018, December 29 to 31, 2018 and February 6 to 9, 2019 which are block-out dates. Guest may cancel or amend the reservation at least 3 days prior to the check-in-date, except for July 21 to August 18, December 15 to 31, 2018, February 5 to 9, 2019, July 25 to August 20, 2019; in which case cancellation or amendment has to be made at least 7 days in advance. An amount representing the first night room rate, extra charge (if any) and 10% service charge will be charged in case of any cancellation made after the prescribed period stated above or no show. Amendment of reservation is subject to availability and Benefit Limits, and no change is permitted after the prescribed period stated above. Disney’s Hollywood Hotel: December 22 to 25, December 29 to 31, 2018 and February 6 to 9, 2019. The advertised rate is calculated based on the lowest room rate in this offer available on this website for two guests aged 12 or above. Extra charge of HK$200 per person per night (subject to 10% service charge) applies to each additional guest aged 12 or above. Actual rate depends on the check-in and check-out date, room type and group mix and is determined at the time of booking. Subject to availability and terms and conditions. Enjoy up to 20％ off Flexible Rate! Please note that you must be at least 18 years old and the authorized credit card holder to book online.